Welcome to Simple Living Mama! I’m so glad you are here! The heart behind Simple Living Mama is to encourage moms in their lives, in their home, and their homeschools. I love working with and encouraging fellow homeschool moms, but even if you don’t homeschool I think you will find information here that is useful! Are you struggling to manage your home? I’ve been there, and there are lots of days I AM THERE! Yeah, with six little ones in my house all day long things get messy fast. How do I deal with it? How do I make sure my house is at least semi-clean and that we have meals every night? ROUTINES! I love routines. First up is my housekeeping routines. I have a morning routine, an evening routine, a weekly routine, and a zone cleaning routine. Yes, it may sound like a lot, but I don’t do it all by myself. The kids have their own cores within those routines. Confused about how it may look? I offer a free monthly cleaning calendar each month that tells you EXACTLY which tasks to do everyday. It makes it easy, and if you’re a homeschooling mom, get your kids to help! What about meal times? Keeping a home seems to revolve around meals and cleaning. 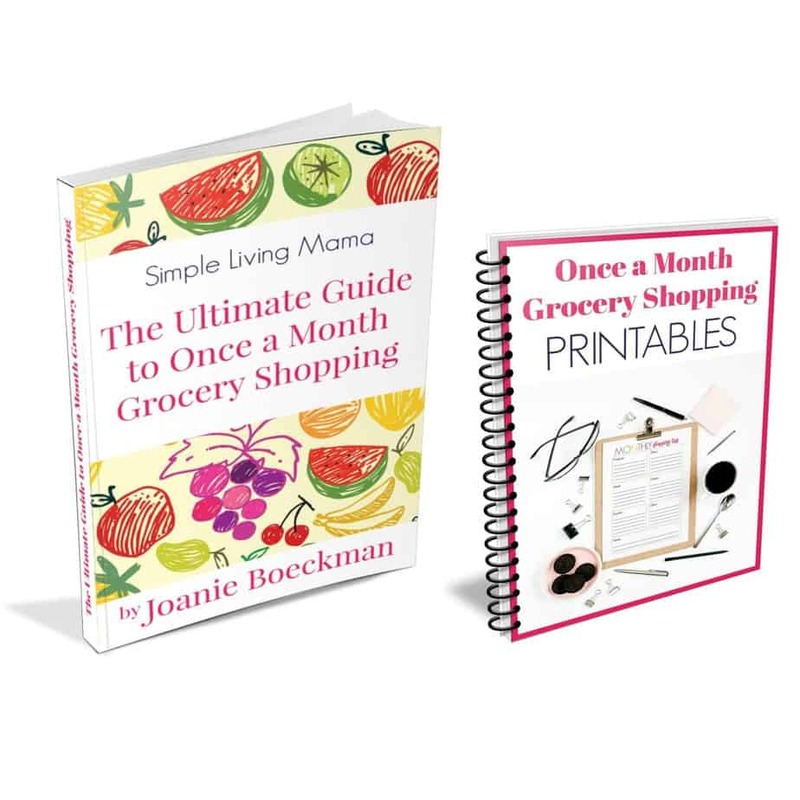 I simplified my meal planning routine by doing Once a Month Meal Planning and Once a Month Grocery Shopping! I even wrote a book about it! Even if you can’t shop once a month, you can still apply these same principles and shop weekly or biweekly. I have an entire collection of simple recipes in my simple living recipes box here on the blog. You’ll find several tried and true family recipes! Mama’s Pinto Beans and Rice and the Salmon Patties are the most popular! So, I love decorating. I would describe my style as minimalist modern farmhouse. I like a few decorations, but not a ton, and I believe in using what you have or getting what you want on a budget. My husband and I downsized our home back in 2015, and we really learned a lot and decluttered A LOT. In 2018, we got an opportunity to move to a new state and move to a home that was a bit larger. Since then, I’ve been showing my little decorating projects here and there such as my farmhouse entryway. I believe in only adding things to your home that serve a purpose and bring joy to your space. I shop thrift stores, Hobby Lobby (when there’s a sale or coupon), Dollar Tree, and Walmart. If there’s one thing I am passionate about, it is homeschooling. In this season of life, homeschool teacher is my main profession. I don’t claim to know it all, or even half of it, but I love sharing what I do know. Do I think a preschool curriculum is necessary? Nope, but it can be a lot of fun if done in a relaxed way, and you can make a lot of wonderful memories with your child. I offer a free course on How To Plan Your Own Homeschool Preschool Curriculum and a post on how to make preschool lesson plans. And to record your plans, I offer My Homeschool Preschool Planner. I also love creating lesson plans! My most popular is my Brown Bear, Brown Bear lesson plan. Two things are think are so important for the preschool years: lots of time in nature and lots of time listening to good books. Find my favorites in these preschool book lists your child will love and learn how I do nature study with preschoolers, too! Since my oldest started kindergarten, we have used My Father’s World curriculum in some capacity. I don’t think it is a curriculum we will necessarily use forever, but we have used it from Kindergarten through My Father’s World ECC. I also have tons of other posts all about homeschooling. You’ll find crafts and activities, advice, and curriculum reviews. Moms, let’s not forget about you. This motherhood thing is tough. I’d venture to say it’s probably the hardest thing you’ve ever done. I don’t have a magic pill that’ll make everything easier, but I’m here to help you through this journey. One of my very best posts on this topic is How To Live Simply When Life Is Anything But Simple. There you’ll find some great ideas for giving yourself some breathing room in your life. As a Type-A personality, I love planning. My free Daily Planning Sheets are an awesome resource for helping you map out your day, especially if you have a lot going on. I use them frequently to keep up with things I need to accomplish on homeschool days. I’m a mama of six, but I’m still very much in the trenches. My oldest is only 9, so I’m still figuring this large family thing out. I love writing about our large family life and how we’re making it work! I would love if you would join our Simple Living Mama community. I send out emails a couple of times a week with new posts and insider tips and tricks! If you have any questions or suggestions, feel free to email me at simplelivingmama@gmail.com!